Your choice of hardware is an important decision as it will have a significant effect on the overall look of your doors or windows. These are the vital finishing touches to your new aluminium doors or windows. Whether you want a modern contemporary feel or prefer a more traditional look we have a wide range of styles and colour options to choose from. Although there are cheaper components available we don't cut costs on the hardware. The rollers, hinges and handles need to be reliable - they are often carrying heavy glass. We therefore only use components recommended by the system supplier. When comparing quotes from other suppliers - ask them about the components they use! 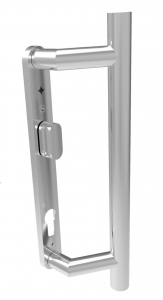 There are a wide range of handles available for commercial properties. We have handles for different applications for example approved for use in schools - with no sharp corners. If you have a particular requirement please give us a call.